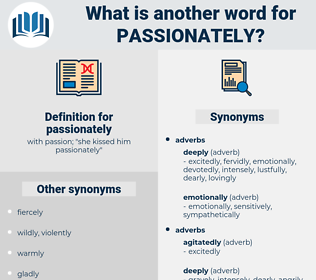 What is another word for passionately? 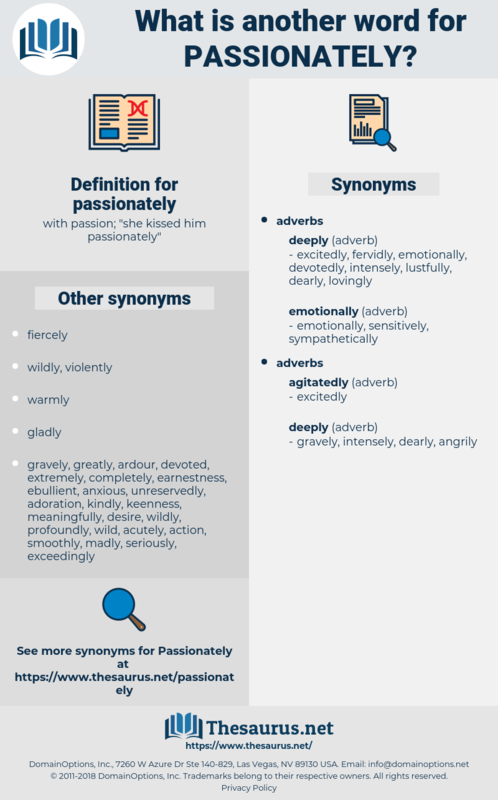 with passion; " she kissed him passionately"
enthusiastically, ardently, vehemently, intensely, wholeheartedly, hotly, strongly, sincerely, earnestly, heartily, vigorously, keenly, firmly, violently, fiercely, intensively, warmly, emphatically, deeply, desperately, eagerly, profoundly, actively, forcefully, strenuously, heavily, utterly, urgently, resolutely, sharply, energetically, robustly, acutely, staunchly, steadfastly, roundly, highly, bitterly. And he pressed her passionately in his arms and kissed her. He felt it all the more because he was passionately fond of women and would have given anything to be attractive to them.